Cheesy grits and pork sausage cook up a Southern version of the breakfast casserole recipe perfect for overnight guests and brunch! I flipped it open and didn’t have to look far before I stumbled across the full page feature. Holla! That’s a first! This recipe is my Southern spin on the more common breakfast casseroles that use bread slices. I had a dish similar to this at a bridal bruncheon once and fell in love. I tried to recreate what I’d eaten and came up with this! I love to serve this any time of year but especially around Christmas! You can also portion this out into ramekins for individual servings! If you come across this recipe in the Taste of Home book you’ll notice there are a few differences. They replaced my breakfast sausage with Italian sausage and added sage. I don’t really think Italian sausage and grits go together (which might be why they added sage?) but what do I know. 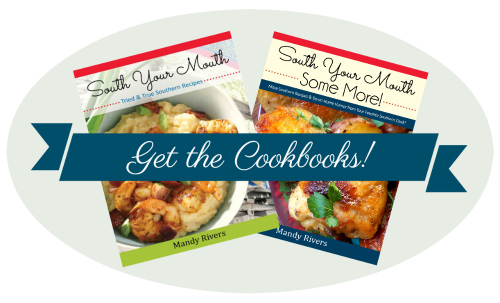 They’re the ones with the successful cookbook business! Bring water and chicken broth to a boil in a large saucepan; stir in salt and grits then return to a boil. Cover pan, reduce heat to medium and simmer 10 minutes, stirring occasionally. Remove from heat; add cheese, milk, butter, garlic, paprika and cayenne pepper; stirring until cheese melts. Stir in sausage and eggs. Spoon mixture into a lightly greased 13x9 baking dish. Bake, uncovered, at 350 degrees for 45-55 minutes or until golden and bubbly and a knife inserted in the middle comes out clean. Let stand 15 minutes before serving. Make-Ahead Directions: Prepare casserole mixture as directed above but do not bake. Cover and refrigerate overnight. Remove from refrigerator; let stand, covered 30 minutes. Uncover and bake as directed. Individual Serving Directions: Prepare casserole mixture as directed above and spoon into ramekins. Bake, uncovered, at 350 degrees for 20-25 minutes or until golden and bubbly and a knife inserted in the middle comes out clean. Let stand 10 minutes before serving. I SO love this idea! Looks fabulous. Congrats on having it featured in a major ToH magazine - WOWZERS! Thanks so much for linking up at Weekend Potluck! I tried this casserole and took it to the office to share with my co-workers. Everyone loved it!! It is absolutely delicious. Thanks for sharing this recipe. YAY!!! I'm so glad you liked it! Did you convert any nonbelievers into grits eaters??? Tried this to take to work. I have a co-worker that is allergic to potatoes and it's hard to find a casserole that doesn't have potatoes. This was a huge hit. Thanks! So glad my daughter forwarded me your site. I need this recipe for a brunch next Monday. One of the ladies is sensitive to gluten. This will work! Thanks for posting it. This looks like a great Breakfast recipe! I hope I'm not too late with a response! I think ham would be great. I'd dice it up fine and fry it up with a little vegetable oil to crisp up the edges a bit. And maybe use 1/2 cheddar and 1/2 swiss cheese. Let me know if you try it! One thing about a "recipe" is that most ANYTHING can be changed in it. If you like squirrel, use it. Can anyone break down the quanities for a smaller dish. There are only 2 of us and we could not eat all this and I don't have freezer room (if it is freezeable). Sounds delicious. cut all the ingredients in half and bake in an 8x8 dish. OMG-this looks delicious! I think this would be a great make-ahead for a weekend camping trip!! Sausage-cheese-grits-what's not to love!? has anyone tried freezing this? I have no idea how grits would do in the freezer, we love this dish but it always makes more than we can eat. Plus with a little one on the way I need some quick breakfast ideas!! I would think it would freeze fine! I've been tempted to buy those little aluminium containers and freeze individual portions. If you try it, let us know! Do you need to let grits mixture cool a bit before adding eggs? Hot grits will completely cook eggs. I didn't. The sausage had been sitting, and cooling, for about 30 minutes while I did the grit mixture. I turned off the heat under the grit mixture (using induction cooktop, so it stopped immediately) and added the sausage to it. I'd already had the eggs in a bowl, beat them and then added to the girt/sausage mix. And poured the whole thing into a crockpot. There was no indication of the eggs cooking prematurely. How many people does this serve? I have to take a brunch casserole to work on Monday and thought this migh do nicely. I guess it depends on how hungry everybody is! LOL... I'd say 12 generous servings. Can stone-ground grits (not instant) be used? I have a bag of stone ground grits that I bought recently at a festival and i'm anxious to use them! Absolutely! You may have to add more liquid - just use the package instructions to figure out how much liquid is required to cook 1 1/4 cups. Thank you!!!! I will be making this soon, likely for Christmas morning! It looks so delicious! Thanks again! Three person family I was already halving the ingredients in my head, I saw that you said use 8x8 but does the cook time go down? by how much? and do you have to cool the grits to add eggs? Does this end up being creamy or is it dryer/firmer? It's creamy when you first take it out but if it sets a while, it will firm up. Making this as one of my Christmas brunch items - so glad I found your site and this recipe! Delicious! Best breakfast casserole I've ever eaten. Great served with southern gravy and biscuits. Cooked in the casserole slow cooker all night on low. Also brought to tennis match in the slow cooker & used extension cord to keep it plugged in. 2 questions...I'd like to make ahead but need to travel about 3 hrs with the dish. What do you recommend? Could I partially cook and freeze? and for individual portions, would a muffin tin work? D-lish! Took it to church for the mens breakfast and it was loved by all- a keeper for sure! 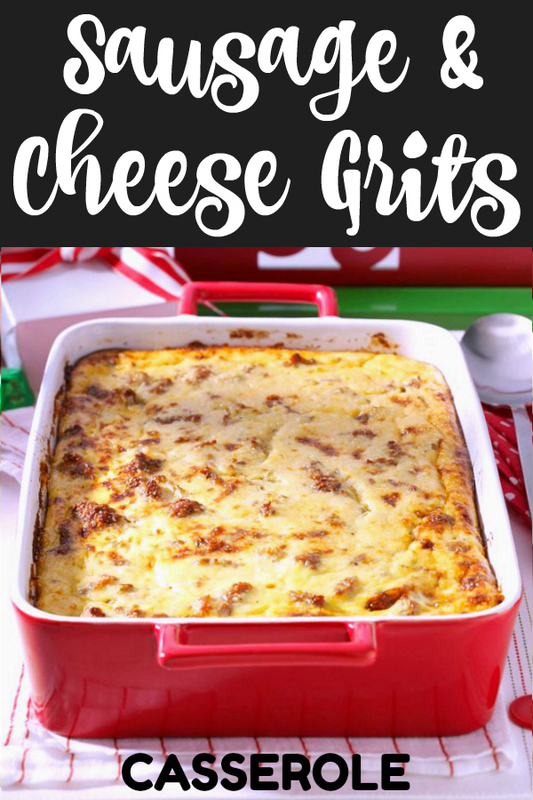 This recipe was a hit with my family on Christmas morning! And tonight I'm making it again (breakfast for supper). Thanks for sharing it! Nice! I'm so happy to hear that! Do you need to temper the eggs before adding them into the grits. What do you think about adding two or three long green (Hatch) chiles to this? 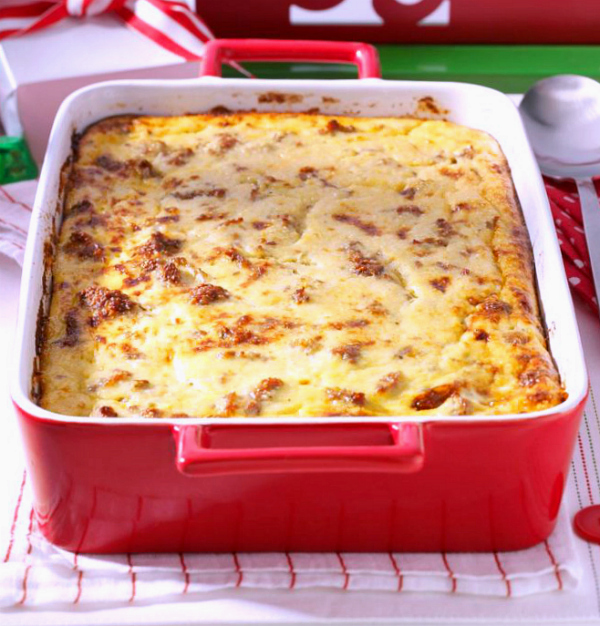 I'm a big fan of chile-cheese grits, and this addition would make this casserole sing to me!